America is the Land Of The Free And The Home Of The Brave (TM), and as such it is built on a number of Great Founding Myths (TM). One of the myths that gets re-told to hapless schoolchildren this time of year is the story of the Pilgrims, who came on their boat, the Mayflower. But what happened to the boat? Every little kid growing up in the USA learns the basic story of this illustrious group of immigrants, The Pilgrims. In case you're not from the USA, though, I'll recount it here, albeit very very briefly because when you get down to brass hat-buckles the founding myth starts to get weird. So here goes. The Pilgrims were a group of, let's be honest, religious nuts, who agreed significantly on issues of religion with the Puritan faction stirring up England in the early 1600s. While Puritans back then were known for their hatred of anything Catholic in the Church of England, nowadays they're known for hating anything fun, like dancing or gambling or an overly exuberant bit of hearty laughter, though I may be just making that last one up. In 1620 the group of Puritans now known as The Pilgrims left England to seek religious freedom for themselves and Nobody Else, thus setting forward their most lasting impression on American society. About 135 people got on board a boat called the Mayflower and set sail for the continent of North America, which was discovered just a scant more than a century before. This was significant because there was already a bigger, more established colony in Virginia, called Jamestown, along with a number of failed colonies, plus colonies throughout the rest of the Northern Hemisphere. So basically, it wasn't really seen as a significant thing at all, at least to the common Englishman at the time. That part will become important in our story later on, though. Neither the boat nor its captain had ever crossed the Atlantic before, which is what employers traditionally refer to as "job experience" when hiring you for something, but the captain was all "I got this, bro," and the Pilgrims decided "well that's good enough" and headed out. Seriously, there's room for barrels, sacks, and some rope, and like no people. Once you got inside there was no room to stand up straight, unless you were somehow under five feet tall, which was possible because it's 1620 and tomatoes weren't a Thing yet. Oh, and because tomatoes weren't a Thing yet, everyone got scurvy. So all their teeth fell out, which was fun. The Mayflower landed in Massachusetts at a place the Pilgrims called Plymouth because that's the place they left from and apparently they weren't very creative. I, personally, would've named it "Mundypants" after a coffee drink I like, but I suppose there's reasons I am not a Pilgrim. 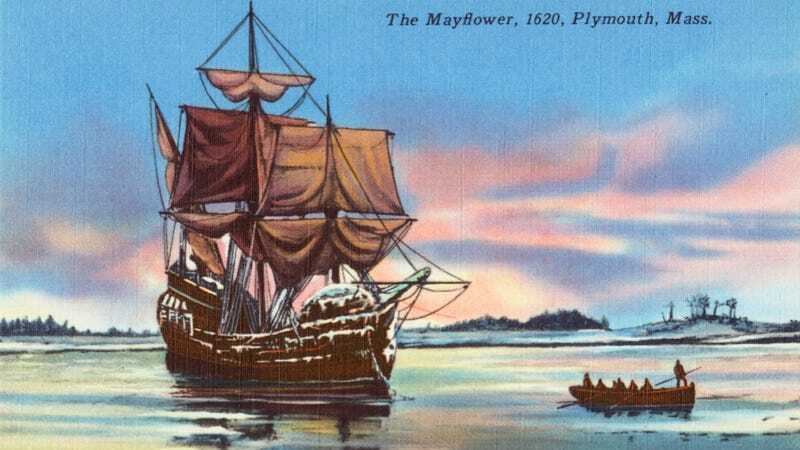 After dropping off the Pilgrims in their non-creatively-named place, mostly to die, the Mayflower sailed on back to England, getting back in about half the time and landing in May of 1621. After that, the Mayflower just sort of... disappears. This great, illustrious ship, which was actually kind of crappy, that was part of one of the Great Founding Myths of America (TM) was kind of just forgotten about. Because nobody really cared about it. It shows up in 1624, but only in some court proceedings as to how best to value it. That's about it in the written record. It could have been torn apart, it could have sank, it could have exploded in a nuclear bomb of religious fury (all of these fates are unverified, and possibly completely unfounded, especially that last one). There is an oral tradition of another fate, however. It could have been turned into a barn. This old gray barn in the middle of Buckinghamshire, England, is claimed to be made out of the remnants of the Mayflower. Located in the middle of the sleepy village of Jordans, it's pretty close to where William Penn, the founder of Pennsylvania, is buried. The area was already a hotbed for American tourists owing to the famous dead guy, so when it was identified as "The Mayflower Barn" in the 1920s, that just fit so very perfectly. For the tourist dollars. The guy who stuck the label on this barn in the middle of England found that the barn was built in 1624, there was a big crack in one of the beams just like on the original boat, and the Mayflower was last heard of in 1624, possibly to be appraised to be scrapped, ergo, ipso facto, Mayflower Barn. Add in some "oral tradition," and you've got a very lucrative business model. Could this actually be the resting spot of the famous Mayflower, a ship nobody really cared about? Maybe. We don't really know, and we might never know. Add in the fact that there were over 30 Mayflowers plying the waters around this time, and some were plausibly broken up for scrap within the era, and you've got a weird bit of history going on indeed. Either way, both the country and the barn have a Great Founding Myth (TM).